The weakening of right side of the heart. Overfilling of lungs and overworking of heart. Increased blood pressure in lungs, leading to pulmonary hypertension. What are the causes ASD? A normal heart is divided into four chambers – two upper chambers are known as atria (and separated from each other by the atrial septum) and two lower chambers are known as ventricles (separated from each other by the ventricular septum). 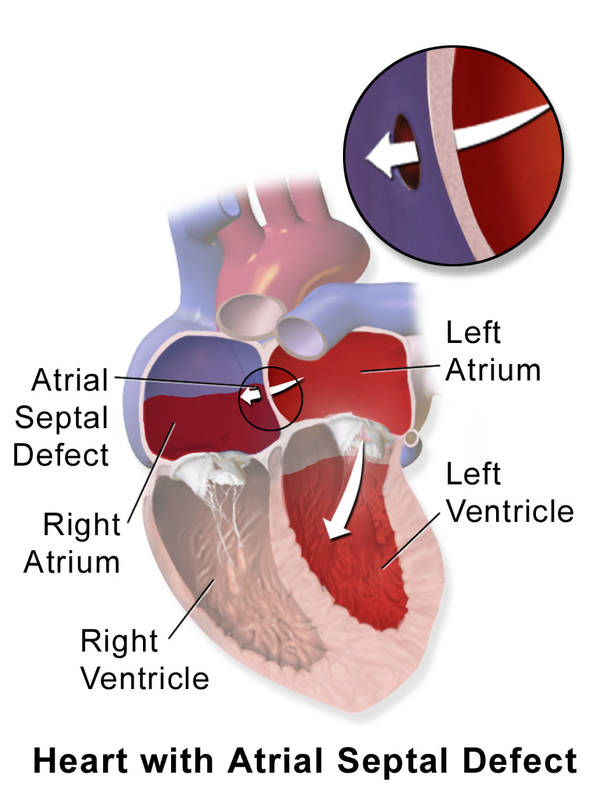 At birth, the two atria are connected through a small opening known as the foramen ovale, which gets sealed gradually with time through the formation of the atrial septum. The disorder takes place at about 5 weeks of pregnancy when heart development generally takes place. Genetics and environmental factors are also thought to play a role in development of the disorder. It is not possible to prevent atrial septal defects but one can take precautions and guidance on immunity, current health condition and family medical history from a health care provider if planning a pregnancy in the near future. Congenital heart defects run in families and may have a genetic linkage with disorders like the Down’s syndrome. The doctor can guide people about the chances of having children with a heart defect if they or their older children suffer from one. Further, a rubella infection and consumption of alcohol or drugs during pregnancy can harm the foetus and increase the risk of having a baby with ASD. A person might not show any symptoms of atrial septal defect if s/he do not suffer from any other heart defect or have a small defect (less than 5 mm), or if the symptoms develop at around 30 years of age or later. A routine examination may detect abnormal heart sounds like a murmur, which is caused by turbulent flow of blood. A general practitioner will refer an affected person to a cardiologist or cardiac surgeon for further investigation of the heart. Alternatively, the affected adult or their child may visit a cardiologist if they experience any of the symptoms listed above. Echocardiogram – Often the first test done for ASD, an electrocardiogram converts sound waves to video images of the heart. This allows the doctor to measure pumping strength of the heart chambers, valves and signs of heart defects. ECG – This method can identify heart rhythm problems by monitoring electrical activity of the heart. Cardiac Catheterization – The doctor can check the heart’s pumping action and functioning of heart valves by inserting a catheter into a blood vessel in the groin or arm and guiding it to the heart. Coronary Angiography – This method is used in patients aged 35 years or more. Blood flow through the heart’s arteries is determined using a special dye and x-rays. For pregnant women, foetal echocardiography will be conducted as part of routine antenatal examinations. An ultrasound scanner creates a picture of the baby’s heart, which is useful in identifying any congenital heart disease. What are the treatment options for ASD? Treatment of ASD depends on the size of the hole in an adult or a child’s heart. The small defect may not require any treatment as these may close on its own during childhood. However, in cases of large septal defects, medication and surgery may be required. Medications – Medications do not treat the hole, but relieve some symptoms and reduce the risk of complication post-surgery. Patients may be prescribed medicines for keeping their heartbeat regular (beta blockers and digioxin) or reducing the risk of blood clots (anticoagulants like warfarin and aspirin). Cardiac catheterization – A plug or patch is guided through a catheter put in a blood vessel (groin) and placed at the site of the hole. Heart tissue grows around the mesh and seals it permanently. Open-heart surgery – Performed under general anaesthesia, the surgeon will stitch or use patches to seal the hole. Get ASD Surgery Cost in India from NABH & JCI accredited hospitals. What are the known complications due to ASD? Developmental issues in children – Delay in development, learning difficulty due to poor oxygen supply during early life that affects brain development. If a patient suffers from other heart defects too, s/he may be prone to developing infective endocarditis (infection due to the growth of bacteria on the surface of the heart). Antibiotics may be required before any surgical or dental procedures. It is essential to keep one’s heart healthy by taking a diet rich in fruits, vegetables and whole grains, and avoiding cholesterol, saturated fats and sodium-rich foods. Persons affected by atrial septal defect can discuss the permissible level of physical activity for their condition with their doctor.